During a trees early age, tree care should always be considered. Taking care of trees at this early age will have many benefits present and future. Many trees are neglected for years or are pruned incorrectly and need a considerable amount of work, which is costly, and can lead to health issues within the tree. 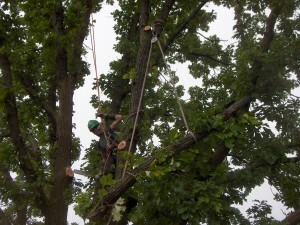 Tree care is a complex industry with many practices involved such as assessing tress, applying the correct pruning, pruning techniques, assessment of pests and diseases, and fertilization. Our recommendations are based on ISA standards which are followed, updated, and re-certified every three years. Topping involves the removal of most (or all) of the tree canopy, which causes a dramatic decrease in food production that is created through photosynthesis in foliage. Exposing sunlight to parts of the tree that would not regularly receive it can cause sun scald on the bark of limbs. By leaving large wounds that take a considerable amount of time to heal, it exposes the tree to possible decay. 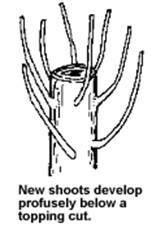 Once the tops are removed, new shoots will grow back much faster than normal growth. Due to the growth of new cells, the new limbs will be elongated due to this faster growth, therefore producing a weaker limb. When trees are not cut at acceptable crotches, it can lead to weaker limb attachment causing poor growth and safety hazards. A tree will heal better if a cut is made at an acceptable crotch. Topping trees obviously adds a tremendous amount of stress. Such stress can cause the tree to drop limbs or possibly die. In the long run, topping will cost more than alternatives because of the rapid weaker growth. 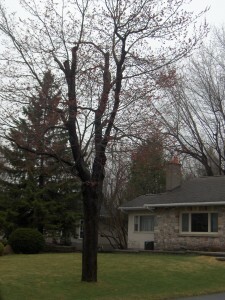 It will need extra care and will cause loss to the property value due to an unhealthy tree. There are a few ways to discourage people from topping. Crown cleaning or crown thinning is an alternative. This involves the removal of any dead, crossing, or defective branches, which will improve the overall health and structure of the tree. Crown thinning helps light penetrate the tree canopy and allows better airflow. When performing these tasks, be sure to only remove a max of 25% of tree canopy at one time. Crown reduction can also be done to reduce the height of the canopy without severely cutting the top off. This involves pruning limbs back to their point of origin or pruning back to a smaller branch letting it become a dominant branch. Remember, when replacing dominant branches, be sure the replacement is one third the size of the branch it is replacing. This shortens canopy branches and leaves a natural look without causing the stressing of topping .